By many measures, Star Wars Battlefront II is shaping up to be the most ambitious game in EA’s history. It’s a colossal, global development effort that spans multiple game modes, genres, and all three film eras. And it’s being managed by three prestigious studios: Criterion Games, DICE, and the newly-formed Motive Studios. I recently had an opportunity to catch up with representatives of all three studios: DICE Producer Craig McLeod, Criterion Executive Producer Matt Webster, and Motive Creative Director Mark Thompson. It’s a juicy conversation — more than 20 minutes of detailed discussion revolving around the game’s conception and how the studio is addressing fan feedback. Battlefront II was strongly influenced by player feedback from the original game. ”After a few months of play, [players] lacked long-term goals,” DICE’s Craig McLeod told me. “These are the things we are looking to nail in Battlefront II.” Prime examples of that increased depth and breadth include the addition of all three film eras, space combat in addition to ground combat, a detailed character progression system, and ongoing free updates to the multiplayer experience. The ambition extends to the game’s post-release DLC support. “We decided to embark down a model of seasons, themed around content drops,” McLeod explained. “We’ll look to keep the community together, that’s really important to us.” Shortly after launch, a Star Wars Episode VIII: The Last Jedi-themed content drop will hit, bringing a new planet and new characters (Finn and Captain Phasma) to the fray. Give it a watch and let us know what you think. Enjoy your weekend! Loved the first one. Longtime Star Wars and Battlefront fan. Thanks for this Sid. Awesome discussion. Can’t wait to pour hours and days into this one. Sounds good, but at the end of the day, it’s just a video game. Will it stand out or push the FPS genre forward? Let’s hope. I have this pre-ordered for $49.99 Canadian anyways and am excited to take on the single player content, and split screen modes. Can’t wait for this journey! Any word on VR support? That first one in SW BF was my favorite VR experience. I would love some sabers, more space battles, or even just looking at vehicles/characters in a garage or something. Same here. Really looking forward to any VR content in this game. Star Wars is perfect for VR and motion based gaming. May the Force be with you. Same here too, i hope the PSVR Support comes true. Really enjoyed this interview! Good stuff Sid. 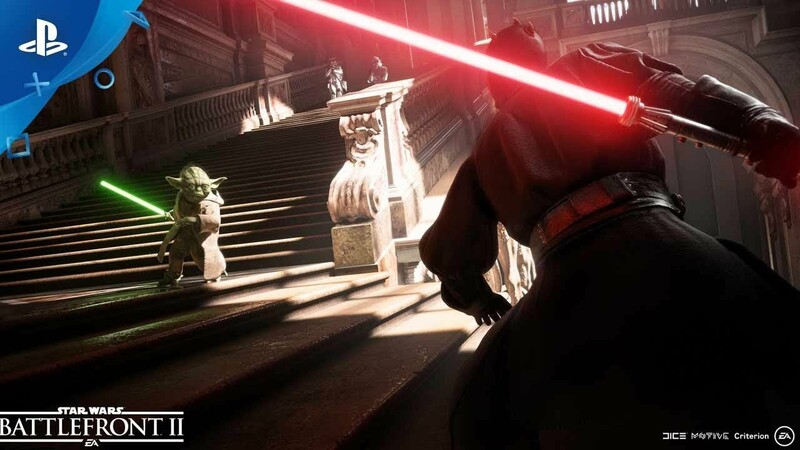 BF2 looks like it will be a lot of fun. Three studios, one mission, more paid DLC! The season pass is free… where have you been? How can a “newly-formed” studio be prestigious? Simple, it can’t. Second, movie tie-ins are never pre-order worthy…as if any game is these days. It’s not as if you get a discount other than possibly a free theme or avatar…big deal. I want the best for a decent single-player experience, but the production seems rushed. Rushed movie tie-ins fail more often than succeed. I am happy to sit and wait for reviews to roll in. If reviews on or before day 1 are good, my chips are in day one. If not, then it will end up being heavily discounted like the last one, so I’ll wait. Personally I hope I don’t have to wait. Why does it feel rushed to you? I had so much fun playing the Battlefront that I can’t wait to get my hands on this one. 3 different studios have been working on this game, so there has been a lot of love and effort put in here, also keep in mind they were able to use many of the assets from the 1st game which gives them more time to focus on new things. Anyways we shall see in few months. Where are the PS Vita news?